Avery’s Beverages is pleased to announce a custom Sebring soda, made just for the Sebring Soda Festival, will be available for tasting and purchase exclusively at the Sebring Soda Festival on April 6. 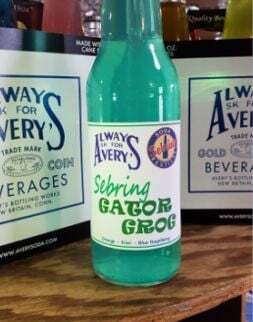 The soda, named Sebring Gator Grog, features orange, kiwi and blue raspberry flavors and is made by Avery’s Beverages, one of the oldest bottling companies in New England. The festival will kick off on April 5 with a Rockin' 50s Block Party from 5 p.m. to 8 p.m., which is free to attend and features live music by The MoonRays, games, fun competitions and more. The actual Soda Tasting will take place on April 6 from 10 a.m. to 5 p.m. and is also free to attend during the day. Tasting Tickets, which are required to taste the 200-plus sodas, are available for pre-purchase at www.sebringsodafest. com as well as tickets to the Pop & Fizz Cocktail Tasting & Pairing Party for adults on April 6 from 4 p.m. to 8 p.m.
INFORMATION: For more information about the Sebring Soda Festival, visit SebringSodaFest.com. For more information about visiting Sebring, go to VisitSebring.com.